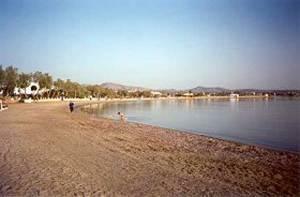 Agios Georgios is the nearest beach to Naxos Town, just a five-minute walk to the south from the Town’s edge. It offers a white, rich sand beach, many kilometers long, and beautifully clear water. A lot of restaurants, bars, and tavernas use part of the beach itself upon which to spread out their tables, so that you can have your breakfast or meal in your bathing suit right on the sand! 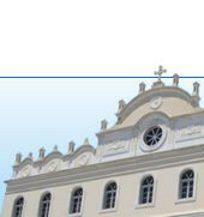 There are, of course, a lot of hotels and other properties for rent in the vicinity. It is considered the most cosmopolitan (and crowded) beach on Naxos. Windsurfing and water sport facilities and equipment are available at this beach. This is a very simple, yet very attractive small two-star hotel located one kilometer from the center of Naxos Town, and 600 meters from the nearest beach.